Built in 1952 by Luders Marine, Stamford, Connecticut. Length 65.0 ft. Breadth 22.0 ft. Depth 6.0 ft. Gross tonnage 65. Owned by the New York Telephone Company, one of the Bell System companies at the time. Cable is carried on a 13 ft diameter drum mounted on the deck, which is rotated by an auxiliary engine. 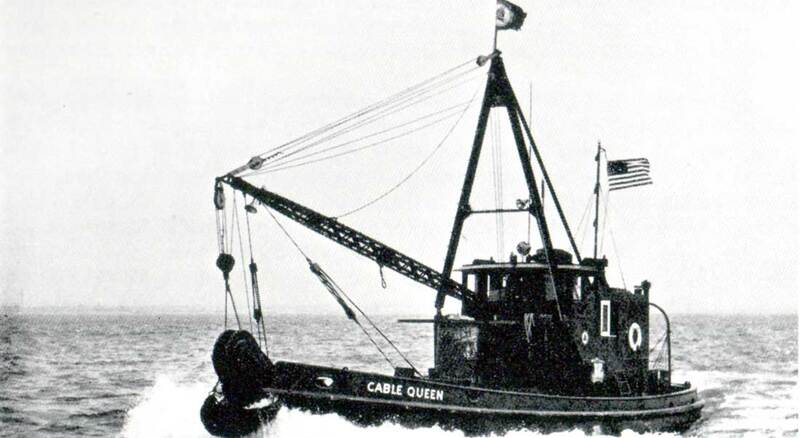 By 1989, CS Cable Queen had laid more than 100,000 miles of cable underwater. Later decommissioned, it is now owned by the NY Submarine Contracting Company, and sits in dry dock near the Kill Van Kull off Staten Island. This film on the Cable Queen's operations around New York City was made by AT&T in 1977.